Google is gobbling advertising dollars that news operations need to survive. I read two surprising facts about Google this week. One is that the information giant is likely to pull the plug on Google News because it’s not working. I’m not exactly sure that that means. 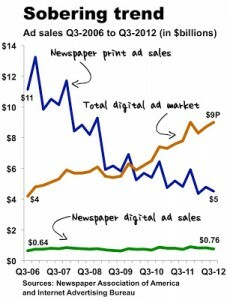 The second is this chart from an article in the Atlantic, which shows that newspaper companies and their websites are not seeing the increase in digital ad sales that we were seeing even a few years ago. I hope my friends in the media will write us on this blog and tell us that’s not true. The comments below the Atlantic article are revealing. I remember speaking at MIT some years ago on a panel on the future of Newspapers and News. I was embarrassed afterward that I had complained that web aggregators, such as Yahoo! and Google, were stealing our content. I took heat from the very liberal audience who believed information should “run free” and that advertising would follow. I wanted to believe that. I should have stuck to my guns about what we then called strategic change. Now the aggregators take the new orgs’ content and their advertising. I am an avid user of digital content and now spend my work life helping businesses use it to tell their stories and sell their products. I still yearn to be part of the news operation even though my current jobs feel a lot like reporting and editing in the new digital world. I still can’t get started every day until I read the 3D news “paper” with my coffee. I was there in the 1990s when Harvard geniuses told us at Poynter that it wasn’t the newsroom that needed to revolutionize, it was the advertising departments. We didn’t move fast enough. I would love to hear from those still in the soup what the answers are. Please comment! The Brazilian spammers are now boring me.